John W. "Jack" Taylor (January 14, 1874 – March 4, 1938) was a right-handed pitcher in Major League Baseball for the Chicago Cubs. He made his major league debut with the Cubs on September 25, 1898. His best years as a pitcher were 1900 (2.55 earned run average), 1902 (1.33 ERA with 7 shutouts; #1 in the league), 1903 (2.45 ERA), and 1906 (1.99 ERA). His career average was 2.66 ERA. In 1904, Taylor set a major league record by pitching 39 consecutive complete games. Taylor actually threw 187 consecutive complete games between June 1901 and August 1906, but this streak was interrupted by 15 additional relief appearances. Thus Taylor appeared in 202 consecutive games without being relieved himself. Taylor and fellow Cub Larry McLean were traded to the St. Louis Cardinals in return for Mordecai Brown and Jack O'Neill in December 1903; he was then traded back to Chicago in July 1906 (in return for Fred Beebe and Pete Noonan). Thus he was part of the great 1906 Cubs; that year the ERA for the entire pitching staff was 1.76. 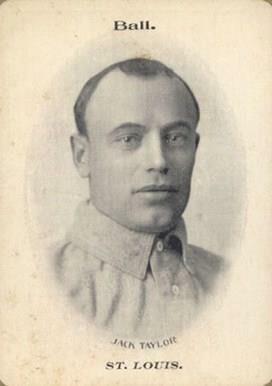 He also contributed to the World Series-winning season in 1907. Taylor died in Columbus, Ohio at the age of 64. The Editors of Total Baseball (2000). Baseball:The Biographical Encyclopedia.